Stuck on what to get your nearest and dearest? Lip balm always satisfies, believe me! And these from this one has received high marks, so give this JACK BLACK Balm Squad Lip Quad and they’ll think you are totally in the know. Mmm to Shea Butter & Vitamin E. Mmm to Lemon & Chamomile. Mmm to Mango & Mandarin and Mmm to Natural Mint & Shea Butter. $25 @ ulta.com. Like us women who choose a scent by mood, now he can too. And I say you can’t lose with giving a man a new fragrance for a holiday gift. 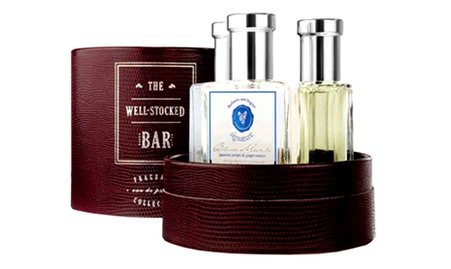 The Well-Stocked Bar from JACK BLACK ($55/1oz each @ nordstrom.com) is three Signature scents in one ‘travel bar’ box – Signature Blue Mark (fresh - Japanese Juniper, ginger essence, and Watermint), Signautre Black Mark (warm – Kashmir Saffron, Cedar and Leather), and Signature Silver Mark (modern – Sri Lankan Cardamom, Wild Cypress and clear, clean woods). Is there such a thing as gender bias sunscreen? A sunscreen that works better on males than females? Hmmm… I’d like to take a pole to see how many men wear sunscreen on a daily basis. Probably not that many but quite a few new men’s grooming lines are cropping up every year so there has to be a demand. From a line that's been around for a long time and will conquer your man’s sun issues is JACK BLACK's Sun Guard Oil-Free Very Water/Sweat Resistant Sunscreen SPF30 ($16/4oz @ dermstore.com) from the Black Diamond Formula Sun Protection collection. It’s oil-free and like the name conveys, contains the new FDA approved sunscreen/anti-aging ingredient Parsol 1789, and made for very extreme conditions. I’m thinking Mohave dessert extreme. They claim the SPF will last 80 minutes after your mate has come out of the water. I would have loved to see that focus group experiment! So, like his deodorant and razor, I will be coveting this one too.